Dancing Barefoot is the full and true story of Patti Smith, widely acknowledged as one of the most significant American artists of the rock ’n’ roll era, one whose audience and appeal reach far beyond the parameters of rock. 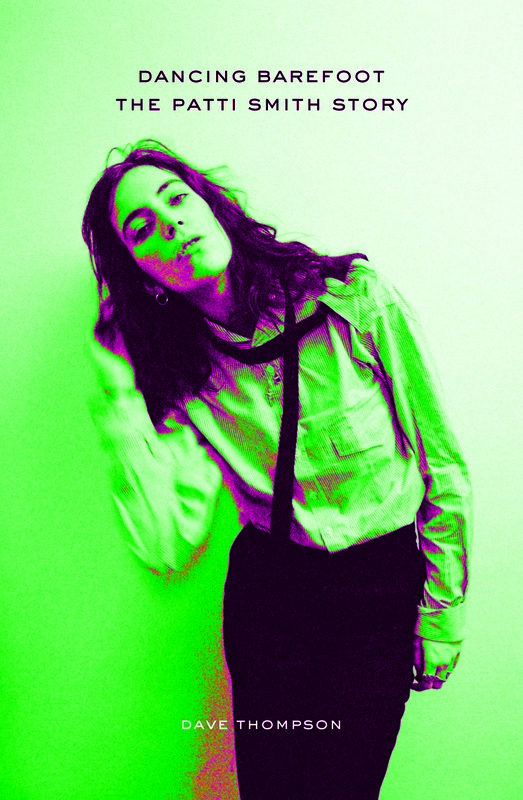 An acclaimed poet, a respected artist, and a figurehead for many liberal political causes, Patti Smith soared from an ugly-duckling childhood in postwar New Jersey to become queen of the New York arts scene in the 1970s. This book traces the brilliant trajectory of her career, including the sixteen reclusive years she spent in Detroit in the 1980s and ’90s, and her triumphant return to her New York home. But it is primarily the story of a performer growing up in New York City in the early and mid-1970s. The stage was as dark as a well-lit stage could be. Shadowed by amplifiers, blocked by her bandmates, and surrounded by the accoutrements that the headlining act deemed essential to their well-being, Patti was performing in near-total blackness. Or so it seemed to her as she whirled around the tiny space she had been able to claim for her own, as she spun deliriously to the music that her bandmates were making, as she reached for the microphone in mid-twist, then tumbled, tripping over a monitor, black in the blackness at the lip of the stage. The Patti Smith Group’s berth as opening act on the latest Bob Seger tour had begun in Chapel Hill, North Carolina, on January 21, 1977, and moved down to the Hollywood Sportatorium in Broward County, Florida, the following day. Tampa was next, and then onward. Beyond the current tour, the group was scheduled to appear at the Nassau Coliseum outside New York City with the Ramones and the Blue Öyster Cult before moving on to West Germany and France in March. But then came Patti’s accident and everything was canceled. They were onstage at Tampa’s Curtis-Hixon Hall, six songs into a set that had already bedazzled the Seger crowd with “Land,” “Ask the Angels,” “Redondo Beach,” “Free Money,” and “Pumping (My Heart).” Now they were pulsing through an extravagantly protracted “Ain’t It Strange,” Patti spinning around the stage—forgetting, perhaps, that their allotted space in Seger’s domain was considerably less than she was accustomed to using. With the stage in darkness, she had either forgotten or not even noticed the monitor that lurked between her feet and the microphone. They were six, maybe seven minutes into the song and suddenly she tumbled, backward over the monitor, to the concrete floor fifteen feet below. It felt as though she were in a Bugs Bunny cartoon, she said later, those frozen moments as a character steps out over a cliff and keeps walking in midair until he suddenly realizes there is nothing holding him up. But she could afford to joke. Although she had not, as some reports were quick to claim, broken her neck in strict medical terms, she had suffered two cracked vertebrae and a handful of breaks in the bones of her face. She was bleeding from wounds that would require twenty-two stitches, and as she was maneuvered out of the venue by a team of paramedics from Tampa General Hospital, her bandmates simply stared in mute horror at one another. The gig was over, that was for certain, and maybe the tour as well. But what else was going to fall victim to Patti’s crash? One does not hold the key, she told herself; he extends it. Lying in the hospital, she could already hear the whispers; convalescing, she heard them louder. There were rumors circulating that she had been drunk or stoned. That she had jumped, even. She would refute them all. If she was in any kind of state, it was a spiritual one—the music and the moment woven into one, driving her to a delirium in which her surroundings ceased to exist. Until the moment they demanded her attention. The cracked vertebrae were not her only serious injury. Her eyesight, too, had been compromised by nerve damage, and for a short time there were genuine fears that her legs might be paralyzed. Spinal surgery was suggested, together with a punishing regimen of physical therapy, but for the moment the best thing that she could do was wait out the immediate injuries with bed rest and sufficient drugs to make her feel normal again. Even the German promoter of her next European tour put the telephone down convinced that the group’s scheduled gigs were still on, after a few minutes of conversation with Patti. But she could not truly rest, of course. Four years had passed since the publication of her last full book of poetry, Witt. Since then just one further collection had appeared, The Night, teaming eleven of Patti’s poems with eleven by Tom Verlaine. It was originally intended to be followed by a second collaborative effort, Independence Day, but that never materialized, and Patti’s only new publication since then was the Gotham Book Mart’s edition of her poem “Ha! Ha! Houdini,” eight pages bound together with a tiny padlock. Now, however, she had time to think, and to consider a proposal from Putnam Books that she curate a retrospective edition of her verse. It would be titled Babel. Roadie Andi Ostrowe took dictation at Patti’s bedside, while entertaining the invalid with recollections of her past life in the Peace Corps. The two women’s friendship dated back to the day Ostrowe turned up at one of Patti’s Radio Ethiopia recording sessions and handed her a letter franked with some Ethiopian stamps. Now she sat and talked of her own experiences in Ethiopia, while Patti volleyed rapid-fire questions back at her. Such distractions, Patti said later, proved essential. All the same, Patti laughed, Babel was born under the influence of the pain pills that she was constantly in need of, and that plunged her into “a very subliminal landscape.” i have been lying here for a long time in stillness, she wrote in “Penicillin (Living Gods).” sick, immobile. i can’t get a grip or feel. Even so, she was rightfully proud of all that she was able to accomplish: sixty-two titled pieces tracing Patti’s evolution as a writer and poet, harking back as far as “k.o.d.a.k.,” “Prayer,” “Georgia O’Keeffe,” “Edie Sedgwick,” and “Marianne Faithfull”; hovering in the present day with “Ain’t It Strange” and “Babel Field”; and, although she was not yet aware of the fact, looking forward to her recovery and return to action, with “Easter,” destined to become one of her best-loved songs. She also drove into the heart of her own increasingly carefully constructed mythology. The opening piece, “Notice,” outlines the requirements of a heroine: the artist. the premier mistress writhing . . . the freedom to be intense . . . to defy social order and break the slow kill monotony of censorship. Little that Patti has written before or since has better encapsulated her own vision of her place in the arts. Friends dropped by, and occasionally she wrote with them. Richard Hell sat by her bedside and they passed the typewriter back and forth, reading what each other had written and then hammering down the next thoughts of their own. Tom Verlaine was there, fresh from recording Television’s debut album, and so was Jane Friedman, her manager. Both of those relationships would be severed before Patti’s convalescence was through—Verlaine by Patti’s love for Fred Smith, Friedman because it seemed that much of her time was now being dedicated to John Cale, as he set up his Spy record label. Lawyer Ina Meibach would handle Patti’s affairs from now on, but only as far as anyone could do that. Patti was her own boss and she always had been, and you stepped on her toes at your own peril. You could ask her doctors about that. Or her bandmates. Apparently the first thing she told them when they came to see her was not to join Linda Ronstadt’s backing band. With Lenny Kaye she hatched the reemergence of Mer, the label they had birthed with their debut single “Hey Joe.” It had flickered only once since then, with the American release of Tapper Zukie’s Man Ah Warrior, but they would fund new operations by leasing the reissue rights for “Hey Joe” to Seymour Stein’s Sire label. Patti was already outlining her intentions for Mer: a home for performers she and Kaye believed had promise that needed to be nurtured. There would be no long-term contracts or long-time aims. Mer was interested only in an artist’s first work, or special projects that perhaps no other label would touch; Patti spoke of producing, and playing guitar on, an album of extracts from the novel The Wild Boys by its author, William Burroughs. That wouldn’t happen, and the Mer project itself was stillborn. But Patti had still more ways of keeping herself occupied. She was arranging for gallery showings of her drawings across New York City and then in West Germany, and she threw herself into physical therapy as though she were Muhammad Ali preparing for a title bout or Mr. America getting ready to take on the world. In fact, those were the examples she named when anyone asked if she should really be pushing so hard. And, when she told her doctors that she had targeted Easter Sunday as the day she would return to performing, even the skeptics among them knew that she would probably succeed. That, she said later, was why that one new poem, “Easter,” was so important to her. It was the day that she would rise from the dead. Great review, and thanks for the excerpt! Can’t wait to check this out.